Scratch off titles of iconic albums as you listen to reveal the artwork underneath. From Abbey Road to Ziggy Stardust, you've already spun some classics. 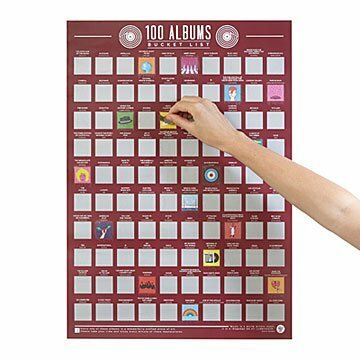 Time for a deeper dive into LP lore with this poster that invites you to listen your way through 100 iconic albums. As you do, use a coin to scratch off each title and reveal surprise, artist-related artwork underneath. It's an interactive way to enjoy essential listening for any music lover. Made in the UK, which gave us Quadrophenia, Led Zeppelin IV, and OK Computer. Click here to see a partial list of album names and artists included. Perfect for a young music fan! My son was able to scratch a number of albums off the list! It's a hobby he has in common with his dad but also makes for unique and interactive decor for his room! I would purchase again! Great gift idea! Its a unique gift for a music lover that is hard to buy for and has a broad range of music preference. Perfect size and a great fit! The poster is fantastic for helping to guide my journey through the investigation of new types of music. I recommend this to anyone with an open mind towards music! Was given this as a christmas present, and it is a wonderful idea. The music is going to be fun to work our way through. However, the poster was kind of beat up and scratched in the packaging, not so bad it is worth sending back though, just not great. Worse though, is the fact that not all of the albums on this poster were actually released on vinyl. Tim Mcgraw's album, Live Like You Were Dying, does not appear to have a vinyl release.